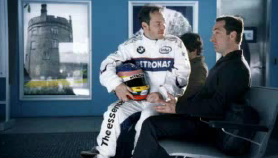 Formula One’s biggest hot-head is in Intel’s latest commercial series. I don’t think you’ll see it in North America because it’s about F1 and trains – you’ll probably only see Intel commercials with hobbits, popcorn and airplanes during prime-time. CORRECTION: I saw this ad during The Office (NBC style) tonight. Thanks also to Ben for spotn’ this. Using the Google maps API and some method of getting the MTO’s data iBegin.com has created a live highway traffic flow map for Toronto. This should prove useful once Toronto Hydro sets the whole city up for WiFi with the one-zone project! When I write code I like to make it interesting. For example, a variable1 named $person can just as easily be name $dude. I once wrote a Flash animation with a function2 that created four rings, naturally I called it audi(). 1 A value that can be set and changed. 2 Bunch of code that does something, written as a function so the function can be executed instead of recreating all of the code in it. Functions are called with their name and brackets at the end in which you can pass values in. get_system_info()- The get_system_info() function tells you more than you want to know about the physical capacities of your computer…. is_computer_on() - Returns 1 if the computer is on. If the computer isn’t on, the value returned by this function is undefined. is_computer_on_fire()- Returns the temperature of the motherboard if the computer is currently on fire. 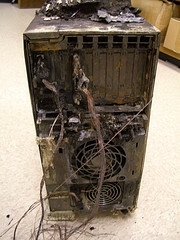 If the computer isn’t on fire, the function returns some other value. Avoid pronouns. If your E-Mail is about something technical your reader will soon lose track of what ‘it’ you are talking about. It also helps with scanning. Try to model your sentence and paragraph structure on that of The Toronto Sun, etc. Put thought into the E-Mail subject, and if the original in a reply/forward exchange is poor, change it. Watch out for those homonyms and the spell checker. You want to be sure your message can be red. And last, but not least (but maybe the least practised): Read back your own E-Mail (or blog posting) to yourself before you send it. Around 2:00 today this truck carrying a load of rolled paper/fiber turned over on the tightest corner of the 406 north in St. Catharines Ontario Canada. This picture was taken from the St. Paul’s street bridge directly above the paralyzed truck. The 406 highway is the major artery of the Niagara region after the QEW. Despite what the regional representatives say, this highway is rarely congested and this ~5 hour closure of the northbound lane is not common. 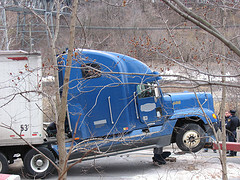 Peninsula Towing & Recovery was on the scene to right and remove the truck. Rumour has it that each truck is $400 an hour per truck. It would appear that the driver is OK and no other vehicles were involved. The driver’s first priority was duct tapping over the rig’s logo, he had done so before the truck was righted. My pictures can be found on flickr.com. Here’s video of the truck on it’s way. You are currently browsing the iMatt :: The Blog of Matt Clare weblog archives for March, 2006 .